Origin and Habitat: Bulbine vittatifolia is a rare South African endemic(Northern Cape: Namaqualand). Altitude range: Around 800-1000 meres above sea level. 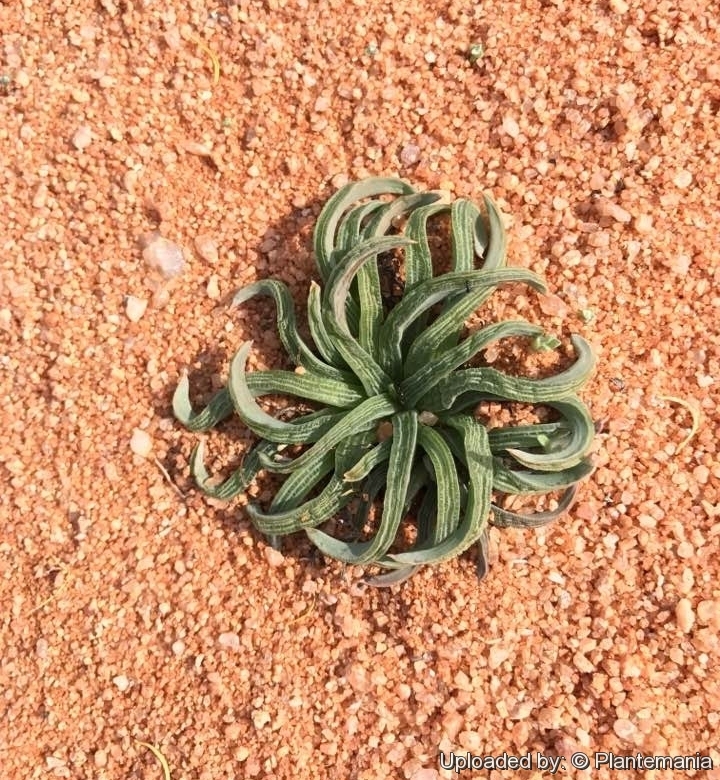 Habitat and Ecology: Succulent Karoo. This species grows on a flat quartz plain. Bulbine vittatifolia flowering in mid-summer or early autumn, but the flowering might be weather dependent and if there is insufficient rain, the plants may decide not to flower at all. The population trend is stable. 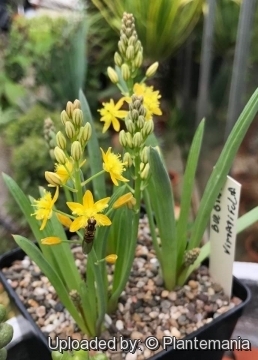 Description: Bulbine vittatifolia is a small succulent, rosulate, deciduous geophyte to 8 cm tall described by G.Williamson in 1996. It is part of the genus bulbine (family Asphodelaceae). Most bulbines are grown for the leaves rather than the flowers, but B. vittatifolia does have a showy yellow flower spike. Tuber: Flattened-ovoid, 3-4.5 cm tall, 3-4 cm in diameter. Leaves: 15-20 in a basal rosette, 20-35 mm long, 2-3 mm wide, erect, upper half curved horizontally towards the light. The leaves are soft, juicy, with pellucid greenish-white base beneath ground-level, the uppermost surface is plane to slightly convex, semitransparent and with 3 dull-green striations, the lower surface is convex, not transparent, the tip is acute, terminating in a mucro (an abruptly tapering point). Inflorescence:: Several (1 to 4), up to 12-19 cm tall with 25-45 spreading flowers, 1-1.5 mm in diameter at the base. The bracts are triangular-acuminate, 1.5 mm long and 1 mm wide. The pedicells are straight, 4-8 mm long. The corolla is star shaped, spreading, yellow, about 12 mm across. The outer perianth-segments are oblong-lanceolate, to 7 mm long, 1.5 mm wide with acute tips. The inner perianth-segments are about 6 mm long, 2 mm wide with obtuse tips. The stamens are 5-6 mm long. The filaments are bearded in the upper half. The ovary is globular, ca. 1 mm in diameter. The style is erect, straight, 4.5 mm long. The stile is capitate. Fruits (Capsules): Globose, about 7 mm across. Seeds: Roughly ellipsoid, angled, ca.3 mm long, 4 mm wide, shiny and black. 2) Raimondo, D., von Staden, L., Foden, W., Victor, J.E., Helme, N.A., Turner, R.C., Kamundi, D.A. and Manyama, P.A. 2009. “Red List of South African Plants”. Strelitzia 25. South African National Biodiversity Institute, Pretoria. 4) African Plants Database (version 3.4.0). “Bulbine vittatifolia G. Will. ” Conservatoire et Jardin botaniques de la Ville de Genève and South African National Biodiversity Institute, Pretoria, "Retrieved 29 July 2017", from <http://www.ville-ge.ch/musinfo/bd/cjb/africa/details.php?langue=an&id=40640>.